Idomeneus was one of the leaders of the Achaeans during the Trojan War, for the King of Crete would bring 80 ships of Cretans to Troy, and Idomeneus was regarded as one of the great Greek warriors. Idomeneus was Cretan by birth for he was the son of Deucalion and (possibly) Cleopatra, and therefore grandson of Minos and Pasiphae. Deucalion was also father to a daughter Crete, and an illegitimate son Molus; this of course made Molus half-brother to Idomeneus, and Molus’ son Meriones, played an important part in the future of Idomeneus. Idomeneus was at the time of the Trojan War the king of Crete, for he was said to have succeeded his father Deucalion to the throne of Crete; although in alternate stories from Crete, Deucalion was killed by Theseus in the time of King Minos. Prior to events at Troy though, Idomeneus was also named by both Hesiod and Hyginus as one of the Suitors of Helen. Idomeneus was regarded as both a brave warrior and handsome, and as a member of the House of Crete, Idomeneus was certainly worthy of the hand of Helen. Ultimately, of course, Menelaus was chosen to be the husband of Helen, and Idomeneus, along with all other Suitors, had taken the Oath of Tyndareus to protect the husband of Helen. Idomeneus having lost out on the hand of Helen would go on to marry a woman by the name of Meda. Two children of Idomeneus are named as a son, Orsilochus and a daughter, Cleisithrya, although occasionally two other sons are named as Lycus and Iphiclus. Agamemnon would call upon the Suitors of Helen to gather their forces when Helen was abducted from Sparta, and at the gathering of Aulis, Idomeneus brought with him 80 ships from Crete. 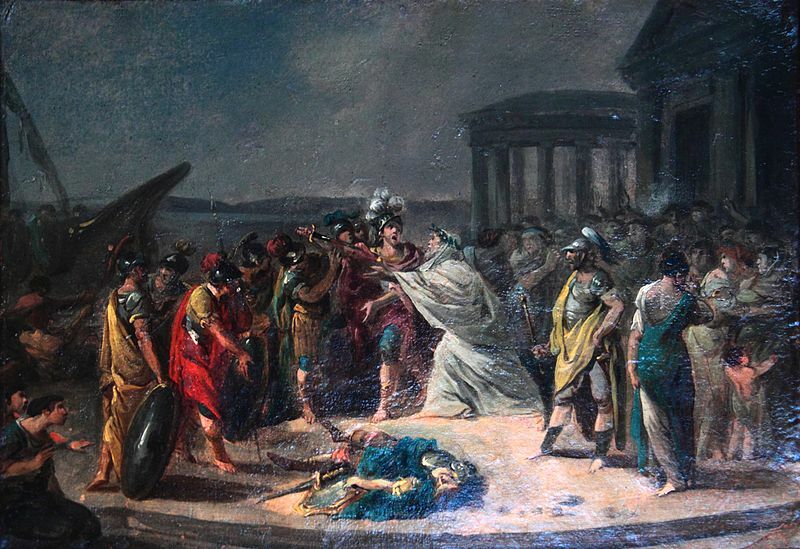 The standing of Idomeneus was such, that at one point it was suggested that Idomeneus be the co-commander of the Achaeans alongside Agamemnon, and although this did not come to pass, Idomeneus did become one of Agamemnon’s counsellors. At Troy, Idomeneus’ nephew, Meriones, acted as charioteer and brother-in-arm for his uncle. Idomeneus was regarded as amongst the bravest of all Achaean leaders, and was one of those who volunteered to fight Hector, the greatest of the Trojan defenders. As one of the bravest of the Greek warriors, Idomeneus was seen as a close comrade of Ajax the Great. Arguably most noted for defending the boats of the Achaeans during a large counter attack, Idomeneus was noted for his skill with the spear, and killed Phaestus, Othryonues, Asius, Alcathous Oenomaus and Erymas with his weapon. 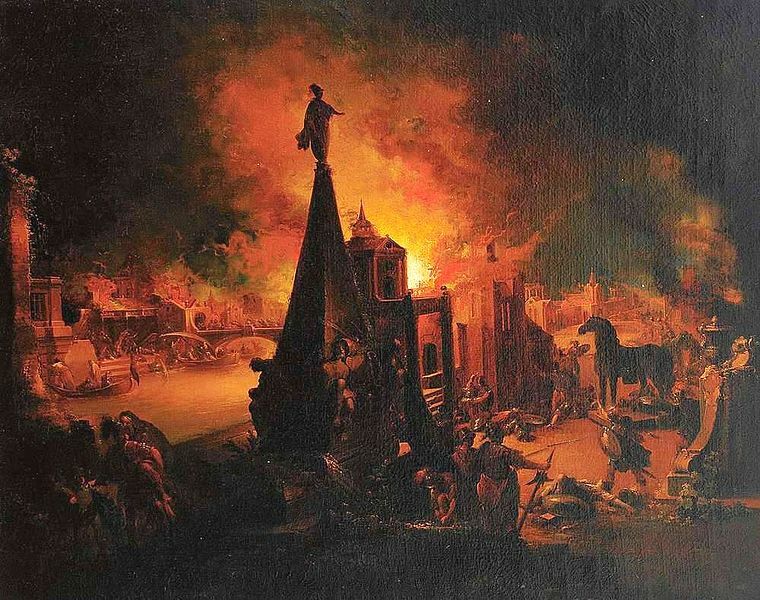 Idomeneus was also named as one of those Achaean heroes who hid within the belly of the Wooden Horse as it entered Troy; and the ruse left the Trojans ultimately exposed to the Greek force, and soon the city of Troy was but a ruin. Idomeneus though was not one of those who committed sacrilege during the sacking of Troy, and so when the war ended, the gods allowed Idomeneus a trouble free return. In the simplest versions of the Idomeneus myth, Idomeneus simply took up where he had left off as king of Crete and husband of Meda, and when he died, Meriones succeeded his uncle to the throne. Tombs for both kings of Crete were to be found at Knossos, and the two men were revered as Cretan heroes. Later writers embellished the story greatly, and instead of a safe return, the ships of Idomeneus ran straight into a terrific storm. To save his ships, his men and himself, Idomeneus would pray to Poseidon for safe passage, and his prayer, Idomeneus promised to sacrifice the first living he saw when landed upon Crete. The storm passed, and Idomeneus arrive back on Crete, unfortunately the first thing that Idomeneus saw was his own son. Keeping his promise, Idomeneus duly sacrificed his son; this is of course in line to Agamemnon’s own sacrifice of Iphigenia at Aulis. The gods though were horrified by the sacrifice and sent down a plague upon the island. To free themselves of their plight, the Cretan people would expel Idomeneus from his kingdom. Some ancient sources tell that Idomeneus was usurped by Leucus, the son of Talos. Leucus had become the lover of Meda during Idomeneus’ absence. Leucus though had later killed Meda, as well Cleisithrya, Lycus and Iphiclus. Thus unable to regain the throne, Idomeneus travelled onto Corinth, and there met up with his former comrades Diomedes and Teucer. In Corinth the three were said to have plotted together to regain their lost kingdoms. Some say that Nestor dissuaded the three from acting, whilst other sources claim that plans were put into effect. Where the plans were made and acted upon, it was said that Idomeneus was actually welcomed back to Crete when news arrived that Diomedes had successfully attacked and retaken control of Aetolia. Thus as King of Crete once again, Idomeneus was in a position to aide Orestes, when he came to Crete seeking aid of the Cretans and Athenians against Aegisthus back in Mycenae. Travelling on from Crete, Idomeneus was said to have created new settlements in Calabria, as well as Grecia Salentina, upon the peninsula of Salento, in a similar way to hat of Diomedes. Idomeneus though was not said to have stayed in Italy, but travelled on again, returning to Asia Minor to the city of Colophon, down the coast from the ruined city of Troy. Colophon was also the home of another Achaean, for it was also the place where Calchas died.